There are several methods of achieving rotations within BabylonJS all of which use a particular convention. In 3D space Euler angles can produce any possible orientation by providing three angles to rotate about each of three axes in a given order. For three axes X, Y and Z there are 12 different permutations for the order of the angles. Since X, Y and Z can be treated as World or as local axes this means there is a potential of 24 different possibilities. Most, if not all,of these are in use in different systems around the world. So you need to be very careful that you know very clearly the convention that the system you are working in uses. Mesh.rotation(alpha, beta, gamma) uses the three Euler angles alpha, beta and gamma which are rotations about the X, Y and Z axes respectively. The convention that Babylon.js uses is based on the yaw, pitch and roll convention and so is carried out around X, Y and Z as local axes in the order Y, X, Z.
References to Euler angles within the Babylon.js community can usually be taken to mean the angles to use with the rotation method. A pitch is about X, yaw about Y and roll about Z applied in the order yaw, pitch roll using local axes. which will produce this orientation whatever the orientation of the mesh prior to its application. The playground below demonstrates this by randomly generating angles and then applying these two methods to two different boxes which remain in alignment. The YXZ convention with local axes has produced a particular orientation and it turns out that taking the same angles (alpha = pitch, beta = yaw and gamma = roll) and applying them in the order ZXY using world axes will produce exactly the same orientation. Imagine a disc with an axle through its center. The disc is able to rotate about the axle. The diagram below shows the disc at several different rotation points around the axle. For all rotations of the disc the axle can be tilted as seen in the diagram below. Together a rotation of the disc and a tilt of the axle can produce all possible 3D orientations of the disc. The tilt, or direction, of the axle can be given by a vector along the axle. This means that another way of giving the orientation of a mesh is with a vector (axle direction) and a rotation (of the disc). So one way of producing any possible orientation is to use four values, three for the axis and one for the angle of rotation. Such a four dimensional vector is a rotational quaternion. where axis is a Vector3 and the angle is the rotation in radians. You cannot use both a rotation and a rotationQuaternion on a mesh. When a rotationQuaternion is applied to a mesh this overwrites the current and subsequent use of rotation producing the wrong orientation. Should you want to use rotation after a rotationQuaternion has been applied, for example on an imported mesh, then the rotationQuaternion has to be set to null. 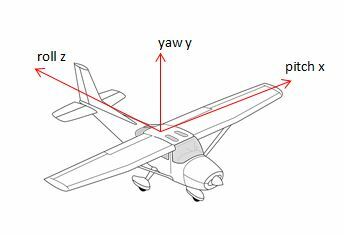 In this convention to take the three angles, yaw, pitch and roll and rotate rotate yaw about Y, then pitch about X and roll about Z using the local axes. Applying the above rotate sequence to a newly created mesh (ie one that has zero rotations) in the order YXZ in local space and applying RotationAlphaBetaGamma to a mesh, with any orientation, using the same angles will produce the same orientation. The playground below demonstrates this by randomly generating angles and then applying these two methods to two different boxes which remain in alignment. Applying the above rotate sequence to a newly created mesh (ie one that has zero rotations) in the order ZXZ in world space and applying RotationAlphaBetaGamma to a mesh, with any orientation, using the same angles will produce the same orientation. The playground below demonstrates this by randomly generating angles and then applying these two methods to two different boxes which remain in alignment. To illustrate this the following playground generates three random angles, puts the axes XYZ into a random order and selects at random either to use world or local for all axes. This data is then used to randomise the orientation of a just created box using the rotate method. The rotate method achieves the rotation by generating and using a rotationQuaternion on the box. The rotationQuaternion generated is used to produce the Euler angles to rotate another box, box1, using box1.rotation to obtain the same orientation as the first box.